Led by Chef Mario Batali and master meat purveyor, Pat LaFrieda, food and drink businesses around the world – from London to Hong Kong, New York to Dubai – will serve-up delicious (RED) culinary experiences to raise money for the Global Fund to fight AIDS, and harness the growing interest in all things culinary to raise awareness that the war against AIDS is winnable. “Anyone who has ever worked in a kitchen knows that sum of our efforts far exceeds what we can do individually. We can only win the AIDS fight by coordinating our actions, and that’s what EAT (RED). DRINK (RED). SAVE LIVES is all about. From June 1-June 10, I’m turning all of my restaurants (RED), and I’m thrilled to see my fellow culinarians doing the same so we can raise awareness and money to help get closer to the beginning of the end of AIDS,” said Mario Batali. •	Omaze.com has teamed-up with (RED) and Mario Batali to offer one lucky winner a prize package which includes a private cooking class and dinner with Mario, plus a behind-the-scenes tour of the Eataly Italian Marketplace. Pat LaFrieda is offering US-based participants a 50% discount on three cuts of meat, while (RED) partner, (BELVEDERE)RED, has created a range of cocktail recipes crafted by Global Head of Mixology, Claire Smith, exclusively for participating bars and restaurants. Peroni is the official beer of EAT (RED). DRINK (RED). 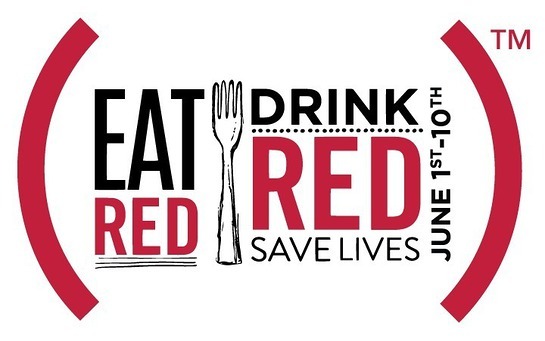 SAVE LIVES, and will be creating (RED) promotions at a number of participating restaurants and bars. Starbucks is proud to support the campaign with a new way to give the gift of (RED) this year. For every Starbucks eGift purchased between June 2-6, Starbucks will contribute a matching dollar amount up to $200,000 to the Global Fund. To participate, customers in the U.S. can select any one of Starbucks eGift designs on Starbucks.com or the Starbucks Mobile App, which will include two new limited time (STARBUCKS)RED designs. Since becoming a (RED) partner in 2008, Starbucks has contributed more than $12 million to the Global Fund. Video: What can 40¢ buy? Let Mario Batali, Martha Stewart, Padma Lakshmi & more tell you. A new PSA featuring top food celebrities will raise awareness around life-saving HIV/AIDS medication which costs as little as 40 cents a day. The PSA shows Mario Batali, Marcus Samuelsson, Martha Stewart, Pat LaFrieda, Padma Lakshmi, Wylie Dufresne, Daniel Boulud, David Burke, Buddy Valastro, Gabrielle Hamilton and Dana Cowin demonstrating absurdly small amounts of food valued at 40 cents, to highlight the low daily cost of medication. (RED) partner, SQUARE, is rallying its food vendor fans across the US to turn (RED) for 10 days in June. Every time a $10 Special Edition SQUA Reader is ordered, Square contributes $9.72 to the Global Fund. Plated – the ready-to-cook ingredient delivery service that allows you the flexibility to choose your recipes each week – is featuring Mario Batali’s ‘Two-Minute Calamari Sicilian Lifeguard (RED)-Style’ recipe in support of the EAT (RED). DRINK (RED). SAVE LIVES campaign, available from mid-May through June 7th. For take-out and food delivery fans, on June 1st, delivery.com will match all member donations of delivery.com Delivery Points to the Global Fund to Fight AIDS. Additionally, for new delivery.com customers signing-up via (RED)-branded ads between June 1st-14th, delivery.com will give a $4 credit to new accounts, and a matching $4 donation to the Global Fund, for a combined matching donation of up to $15,000. OpenTable.com will be listing and promoting (RED) restaurants, while making reservations easy for food fans who want to EAT (RED). Zagat is partnering with (RED) to support the campaign by highlighting top participating Zagat-rated restaurants through lists and features on Zagat.com, while helping readers discover where to dine to have an impact through online promotions and social media. In addition to a $10,000 donation to the Global Fund, LeCreuset is generously providing a 20-piece red cookware set for one lucky home cook to win through a sweepstakes partnership with Eater. Promotion for EAT (RED). DRINK (RED). SAVE LIVES includes a media campaign secured by Hill Holliday, across television, digital, out of home and print including ABC, Bravo, Food Network, OWN and TLC, among many others. To date, (RED) has generated more than $250 million for the Global Fund to fight AIDS, to support HIV/AIDS grants in Ghana, Kenya, Lesotho, Rwanda, South Africa, Swaziland, Tanzania and Zambia. 100 percent of that money goes to work on the ground – no overhead is taken. Global Fund grants that (RED) supports have impacted more than 40 million people with prevention, treatment, counseling, HIV testing and care services.